Joel Darling looks nothing like Bob Vila, but his handiwork is every bit as impressive as anything we ever saw on PBS’s This Old House television series. Darling, who’s lived in Spearfish for about 10 years, is the general contractor who helped homeowners Zana and Arnie Hartman realize their dream of giving new life to an old house at 717 East Grant Street in Spearfish. The Hartmans lived in Alaska for 28 years, and that’s where Zana worked as an interior decorating and design consultant – valuable experience for their “Vintage House Reborn” project. Zana Hartman joined Darling last night (3/2/10) at the March meeting of the Spearfish Area Historical Society to share details – and a few surprises – about the five-year renovation of the old house on Grant Street. And when we say “old house,” we mean “old.” No one is certain of just how old the two-story frame home really is, but its vintage is probably in the 1880 to 1900 time frame. Many folks in the audience remembered when the old house sat at a location that now serves as a funeral home parking lot. It was moved up the hill onto East Grant Street in the 1970s. It wasn’t until about five years ago that Zana and Arnie began the ambitious job of renovating and adding on to the old house. “We’ve done remodeling projects before, but nothing like this,” Zana told the historical society. Darling, who works for West River Masonry, has extensive contracting experience and teamed up with the Hartmans to tackle the massive project. It involved jacking up the house and strengthening the foundation, adding a basement, a garage, and numerous other features to the 19th century structure. Sky lights and glass blocks were installed. Windows were replaced, and a new garden shed arose from the dilapidated out building behind the house. The stairwell was widened and fortified, and a stairwell to the new basement was added. Wiring and plumbing were all re-done, and everything was brought up to code. “It was not an easy task,” said Darling. 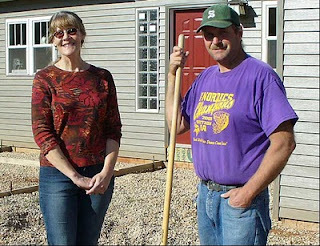 At left, Zana Hartman and contractor Joel Darling pause for a moment in the back yard of the Hartman house. There have been more than a few surprises along the way -- what Zana calls "curiosities." While it wasn’t a daily occurrence, Darling said they began to routinely discover artifacts behind walls and under floors. Items ranging from an1863 sewing needle to medicine bottles and old magazines were found tucked away, as if in a time capsule. There was even a collection of hair found – and one can only speculate for what purpose it was saved! Although it was not yet finished, the Hartmans were able to occupy the house in September of 2008. The past 18 months have found them putting the finishing touches on everything from interior décor to built-in electronics. Visit our Spearfish history Photo Gallery for some photos and additional information about Vintage House Reborn. “It’s a 5 Star Energy Home, and our utility bills are a lot less than they used to be,” said Zana Hartman, noting that their energy bills were nearly four times as much in the old Homestake house where they previously lived. The video presentation and artifact display spurred lots of questions, and discussion about the project continued while attendees bellied up to the snack tables for treats and drinks. The concept of giving new life to an old house served as a good prelude to the upcoming April program at the Spearfish Area Historical Society. Veteran presenter Linfred Schuttler returns on Tuesday, April 6th, with a topic entitled, “The Town of Spearfish, Born 1876, and Born Again….and Again…” The 7:30 p.m. program will be staged at the Spearfish Senior Citizen’s Center and is open to the public.